This nature area was created in 2008 and 2009 by the Parish Council in conjunction with a local volunteer group together with support from the National Lottery. 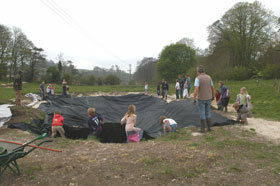 The £9,000 grant from the Lottery enabled the site to be landscaped with a central feature of a wildlife pond. The wildlife area is located just to the west of the Community Orchard on Herrison Road. Further works included tree, shrub, traditional hedge and wildflower planting. 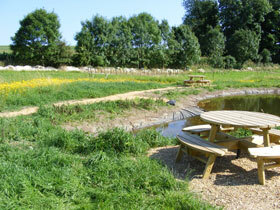 The site includes picnic tables for people to sit and enjoy the wildlife. A local artist created a unique carved table and chairs for children to enjoy overlooking the pond. The site is now managed by the Parish Council and has free public access.